This page has photographs and links to some items about me that have appeared in the media. Also see the Afrikaans version. Review of Parts Unknown in the Cape Argus. Interview with Cindy van Wyk in the Namibian. 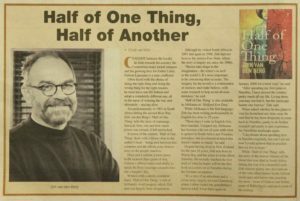 Interview with Nadine Maritz about the film rights for Half of One Thing being optioned, 2016. Blog review of Nobody Dies by Mack Lundy, 2012. Interview with Allan Guthrie on his Criminal-E blog, 2011.
Review of Nobody Dies that first appeared in NZ Listener, 2004. Interview on Kiwicrime blog, 2012.